This home features a dramatic vaulted ceiling in the living room. 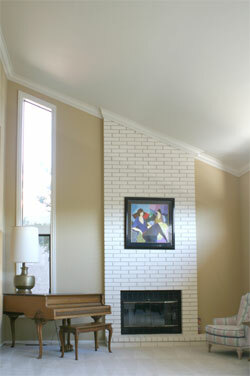 Mark's suggestion was to follow the roof line with the crown moulding, crossing over the brick of the fireplace. Everywhere there is an angle or a point makes a nice detail. 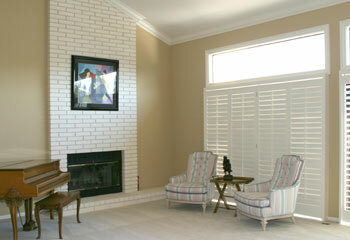 So again, what appears to be a problem often turns out to be one of the nicer features of the room. The results are spectacular! 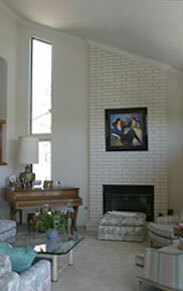 In her video interview, she comments that people came to see the results and couldn't believe how well the crown worked with the brick fireplace. Mark has used this same combination in his own home. The 6 inch moulding around the windows adds substance to the room without sacrificing the airy, spacious lines of the living room. 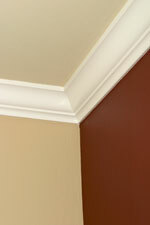 People tend to be afraid to use moulding because they don't know how to handle changes in surfaces or uneven ceilings and walls. These challenges often turn out to be the very details that make the job successful! She had been concerned about how to end the moulding in this area and was delighted that this problem turned out to be an asset. 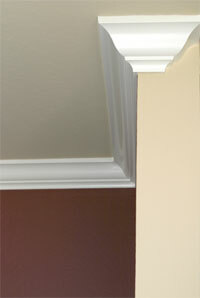 Let Moulding Masters help you solve any problem areas - they might turn out to be your favorite detail! 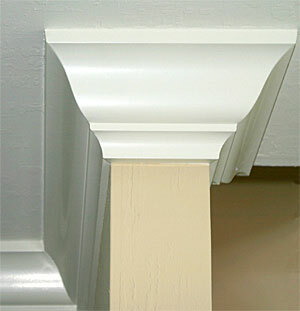 Click here to see Colonial Molding in Catalog. With paint the result is even more beautiful. 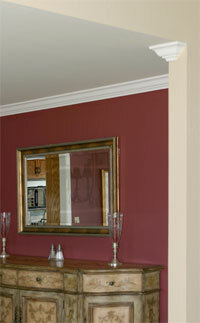 The dining room introduces a new color, a deep claret which looks gorgeous against the satin cream finish of the crown moulding. The returns are accents which Mark exploits to the fullest - they are handsome features in themselves, and this owner specifically mentions a return as her favorite item in her renovation.